(New York, NY, October 23, 2014) – The nomination of Greg York, president and CEO of Vann York Honda in High Point, North Carolina, for the 2015 TIME Dealer of the Year award was announced today by TIME. York is one of a select group of 55 dealer nominees from across the country who will be honored at the 98th annual National Automobile Dealers Association (NADA) Convention & Exposition in San Francisco, California, on January 23, 2015. The announcement of this year’s nominees was made by Jed Hartman, group publisher, worldwide, TIME, and Tim Russi, president of Auto Finance for Ally Financial. "The dealers nominated for this award are dedicated business owners, auto lovers and, most importantly, champions for their local communities, with a willingness to give back on a grand scale," said Russi. "Ally is proud to honor and support these dealers as they work today and tomorrow to build better places to live, work and do business." In its fourth year as exclusive sponsor, Ally will recognize dealer nominees and their community efforts by contributing $1,000 to each nominee’s 501(c)3 charity of choice. Nominees will also be recognized on AllyDealerHeroes.com, which highlights the philanthropic contributions and achievements of TIME Dealer of the Year nominees. The TIME Dealer of the Year award is one of the automobile industry’s most prestigious and highly coveted honors. Recipients are among the nation’s most successful auto dealers who also demonstrate a long-standing commitment to community service. York, 51, was chosen to represent the North Carolina Automobile Dealers Association in the national competition – one of only 55 auto dealers from 17,000 nationwide – nominated for the 46th annual award. The award is sponsored by TIME in association with Ally Financial, and in cooperation with NADA. A panel of faculty members from the Tauber Institute for Global Operations at the University of Michigan will select one finalist from each of the four NADA regions and one national Dealer of the Year. "Looking back, nothing has been more rewarding than learning the retail car business from my parents and then growing our business together," nominee York said. "We created a team and a culture that understands that you can do ‘what is right‘ for employees and customers – and as a result be very successful." A 1981 graduate of Westchester Country Day School in High Point, North Carolina, York earned a B.A. in economics from Duke University in Durham, North Carolina, in 1985, and graduated from the Executive Institute at UNC Kenan Flagler School of Business. In 1987, after working as a successful bond trader, York returned to his family’s car business, which was founded by his parents Vann and Ann in 1970. "Family lore has it that each York kid is born with a sales quota," he quipped. "As a second-generation business owner, I have been able to build on the entrepreneurial work of my father, expanding the business while maintaining its golden reputation for customer service in the local market." He worked at several of his family’s dealerships before becoming president of the Vann York Auto Group in 2000, which now encompasses four dealerships representing nine franchises, a finance company and a used-car operation. Though the economic conditions in High Point have ebbed and flowed over the years, York’s company continues to prosper and to support local programs and initiatives. "Through personal service and corporate philanthropy, and through fostering a corporate culture that encourages and trains employees to be customer and community advocates, we are committed to community engagement," York said. York is proud of the impact he has made supporting the United Way campaign for Greater High Point, which greatly benefits from services that are funded by the organization. 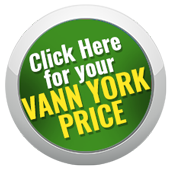 He developed the Vann York Car Giveaway which has encouraged individuals to donate at a "fair share" level for a chance to win a new car. York chaired the campaign in 2011 that raised a record $4.7 million. "The United Way of Greater High Point is now second in the state in per-capita giving. We are humbled by our involvement and the many lives these contributions have helped." Currently, York serves as director/vice-chairman of High Point Bank and Trust; director, finance committee chair of High Point Regional Health; and board member for the United Way of Greater High Point. He has donated his time and talents to the Wesley Memorial United Methodist Church, Westchester Country Day School, Duke Divinity School, Open Door Ministries, Boy Scouts of America and High Point University. Receiving the North Carolina Family Business of the Year award from Duke University’s Family Business Forum is most meaningful to York. "It was affirmation from outside of our industry that our company and family were operating a successful business and making a positive impact on our employees and our community," he said. York was nominated for the TIME Dealer of the Year award by Robert J. Glaser, president of the North Carolina Automobile Dealers Association. He and his wife, Caren, have three children. TIME is a global multimedia brand that reaches more than 60 million people and includes the domestic and international magazine editions, Time.com, tablet versions, mobile, social and TIME for Kids. Time.com's network of sites draws more than 35 million unique visitors per month (August 2014 comScore). Ally Financial Inc. is a leading automotive financial services company powered by a top direct banking franchise. Ally's automotive services business offers a full suite of financing products and services, including new and used vehicle inventory and consumer financing, leasing, inventory insurance, commercial loans and vehicle remarketing services. Ally Bank, the company's direct banking subsidiary and member FDIC, offers an array of deposit products, including certificates of deposit, savings accounts, money market accounts, IRA deposit products and interest checking. Ally's Corporate Finance unit provides financing to middle-market companies across a broad range of industries. With approximately $149.9 billion in assets as of June 30, 2014, Ally operates as a financial holding company. For more information, visit the Ally media site athttp://media.ally.com or follow Ally on Twitter: @Ally.